The Zambian Ornithological Society invited me to run a bird ringing course on Bovu Island, on the Zambezi River, about 60 km upstream of Victoria Falls. A total of 327 birds of 45 different species were ringed. The most ringed species was Red-billed Quelea (mostly juveniles) that were feeding on sorghum crops. 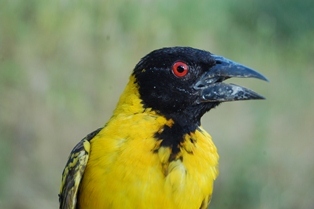 An interesting catch was a Village Weaver with a black head (nigriceps race) unlike the South African race which has a black mask but yellow crown. There have been several reports of 'black-headed' Village Weavers in South Africa - see here and follow the successive links to earlier reports. A female and juvenile Village Weaver were also ringed. After the course I briefly visited Victoria Falls. The falls are at maximum flow, providing lots of spray and a thunderous sound. Read the trip report here, which includes photos and a full list of species ringed.